The Academy for Medical Science Technology's program of study is a system-based approach to medicine that allows students to learn the basic sciences in an integrated format. Students fulfill academic requirements in mathematics, humanities, foreign language and the arts. Transdisciplinary class-wide projects, from ninth through eleventh grade, develop teamwork, communication and presentation skills promotion an integrated, multidimensional approach to learning. All students complete core areas, complemented by required units in humanities, creative cultural arts, physical education, health, projects, and also choose electives each trimester. All academic courses are taught at the honors level or above. 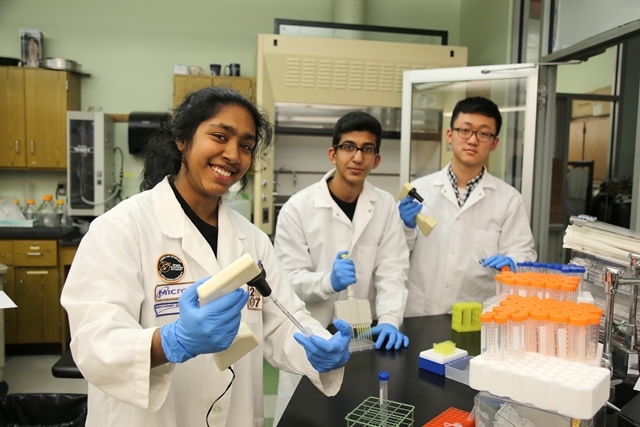 The Research programs at the Bergen County Academies operate within highly sophisticated, sate-of-the-art laboratories that have been designed and equipped to allow exploration within a variety of scientific disciplines. The labs are functional, professional entities, not normally found in a high school setting. They include cell and molecular biology, nanotechnology, microscopy and a variety of engineering programs. Many of our students have won significant national and international awards, and some have been able to publish their finding in professional journals.